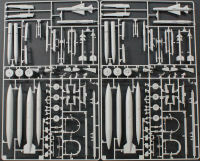 These decals are very nicely done complete with an extensive set of airframe, pylon, and weapons stencils. Since these were printed by Cartograf, you shouldn't have any problems with decal performance. The selection of subjects provide three bare metal examples as well as four camouflaged airframes to choose from. You'll love these instructions - Italeri is using their CAD drawings to illustrate the assembly steps and while there are 44 pages and 39 assembly steps, each step contains a limited number of parts to make the process move along steadily. The instructions do note that ballast is required in the radome to keep the model from becoming a tail sitter. Since no recommended weight is provided, I would suggest putting the radome on after you've added the landing gear (usually after painting for many of us) so you can find the right weight for your configuration. A few years ago, I had declared the Eduard 1/48 Mirage IIIC as the best kit of this subject at that time and nothing has challenged that position until now. I think Italeri has produced a winner with this kit and we'll declare this to be the best Mirage IIIC in any kit scale. My sincere thanks to Hobbico for this review sample!